I'm on a mission - no new paint comes into the workshop until the existing paint cans are empty. Kind of a challenge when your mind steers toward all the colors you don't have. 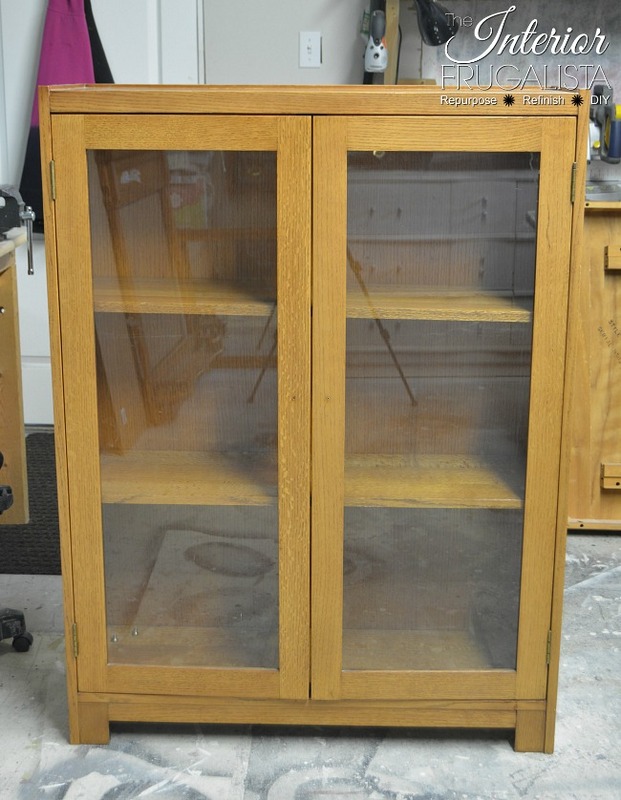 The only vision I had going in was that I wanted this Vintage Double Glass Door Bookcase from 1957 to look like a Farmhouse Style Cupboard. I hemmed and hawed about what color to paint it because it will be going to my booth. I had a strong urge to play it safe with white, which was very hard to resist considering I had a full can of white chalk paint in my stash. 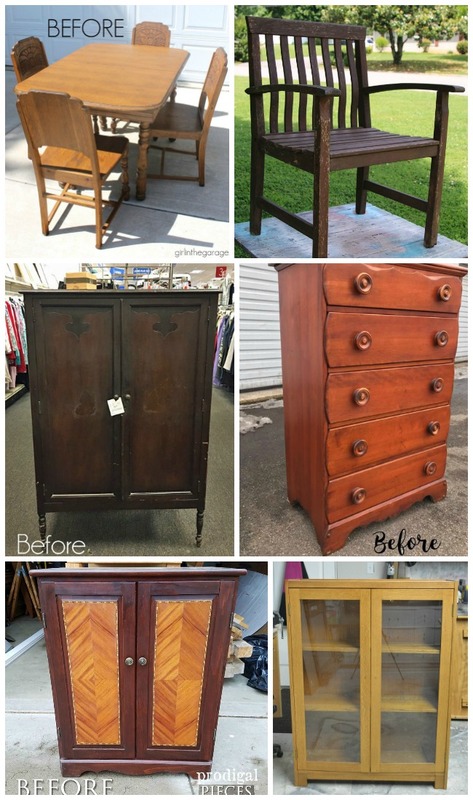 I had half a can of Annie Sloan Chalk Paint in the color Old Violet leftover from Old Violet: A 1940's Waterfall Sideboard and another in Arles leftover from Waterfall Headboard Bench With Leather Hide Seat. While my brain said no, my gut said throw on the first coat and go from there...and so I did. 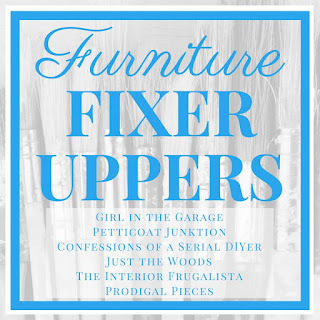 Before I get into the meat and potatoes of this makeover, I should mention that today is Furniture Fixer Uppers day. 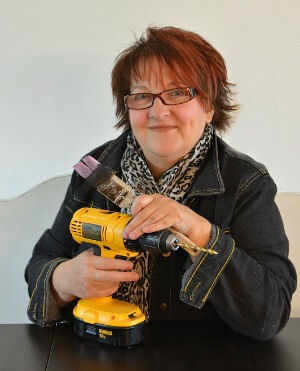 That means six talented furniture reimaginers coming together to bring you six fabulous furniture makeovers. This was one of those makeovers where I truly was flying by the seat of my pants and told my head to take a hike and let my gut the bookcase speak to me. 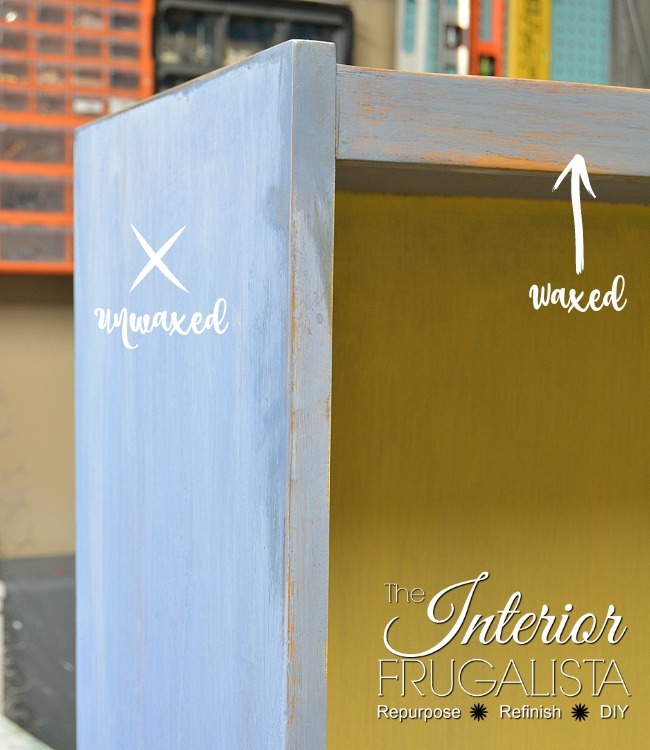 This is a perfect example of, "if you don't like where the makeover's going, change it - it's just paint". 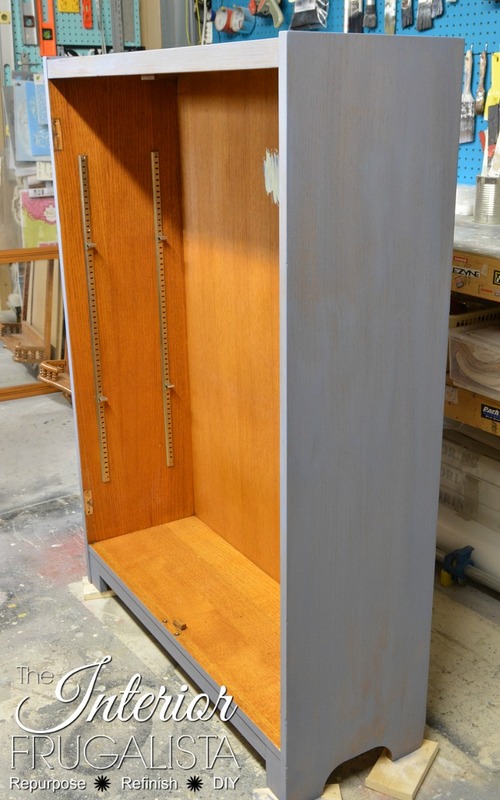 After brushing the second coat of Old Violet on the bookcase I moved over to the doors to do the same. 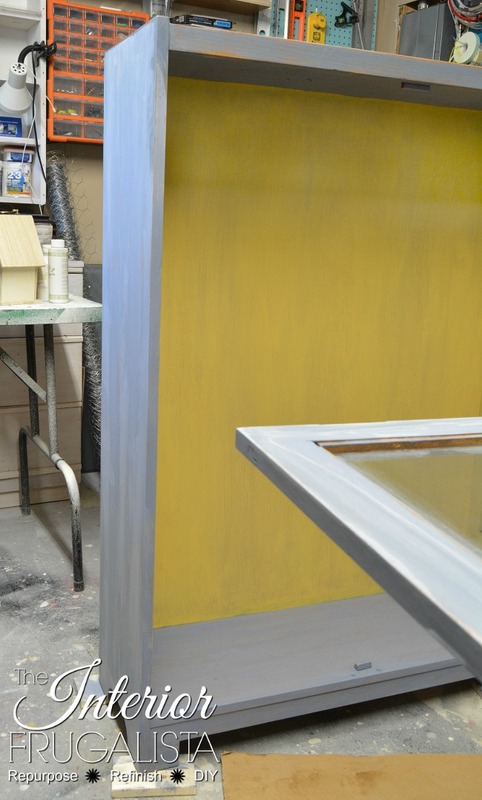 What I discovered was the first coat had a lovely washed appearance that I really liked. Why I didn't discover this before applying the second coat on the bookcase is beyond me. Poor lighting? Asleep at the wheel? Hyper-focused on the original plan? Now panicked that the second coat of paint was drying, I dipped my brush in water and applied pressure to thin the paint, unloading the excess paint off the brush and back into the can (waste not want not). While wet I removed more paint (wet distressed) with a paper towel to reveal some of the wood underneath. It took a lot of paper towels and reloading the brush in water but it worked, giving me the same washed appearance as the doors. 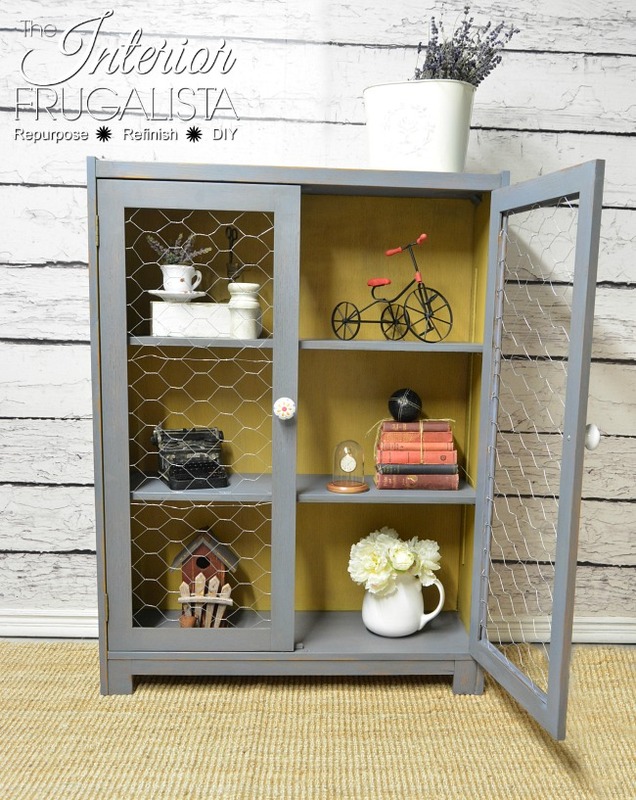 Again, wanting to transform this bookcase into a farmhouse style cupboard it needed an antique dirty finish. 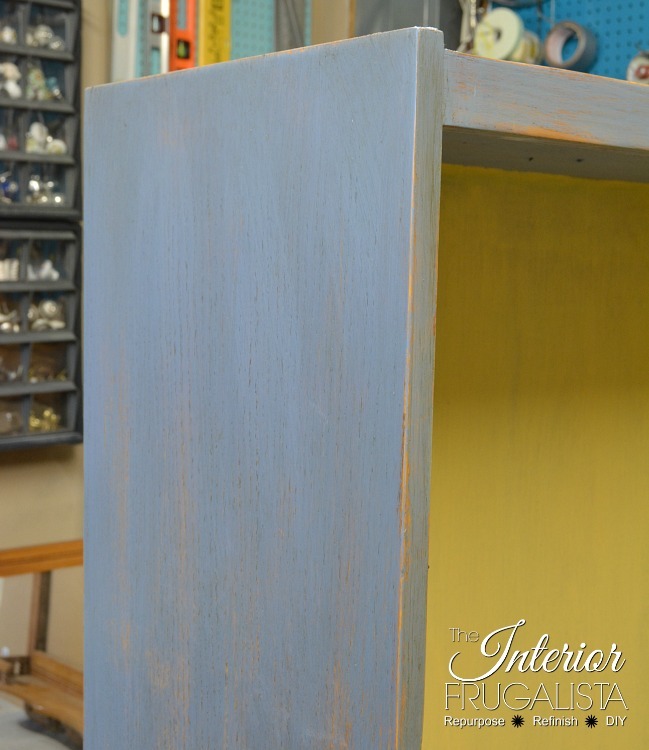 First I applied a coat of clear wax with a round wax brush, which really deepened the old violet-blue color and enhanced the distressed finish. While the clear wax was still wet I applied a coat of dark wax, rubbing it into the wood grain and nooks and crannies with a small round wax brush in sections. Again I hemmed and hawed about what color to paint the interior. Initially, I was going to install tongue and groove pine boards to the back but time is money, as they say when flipping furniture. Instead, I painted the existing oak backboard with Annie Sloan Chalk Paint in the color Arles, pulled from the colors in the new knobs for the doors. 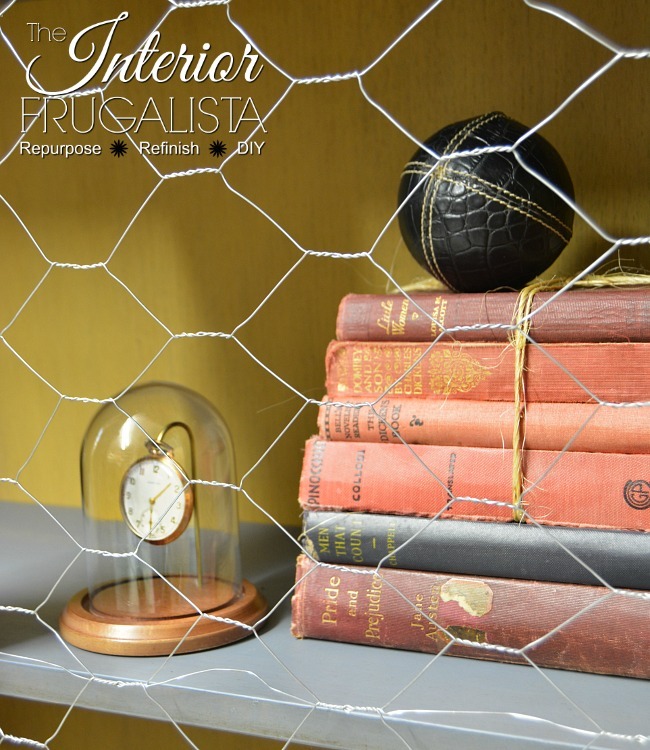 Initially, the plan was to etch the glass using a farmhouse stencil until my eyes landed on a roll of chicken wire in the corner of the workshop. 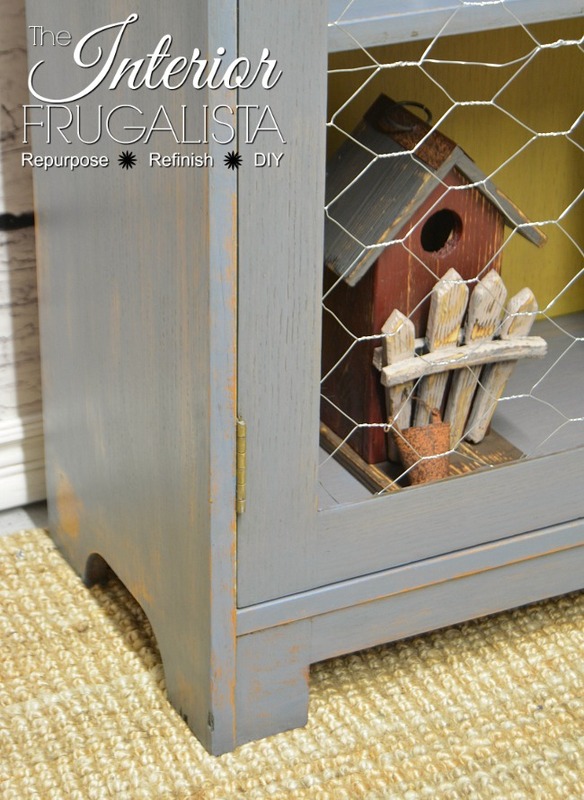 What says farmhouse more than chicken wire, right? 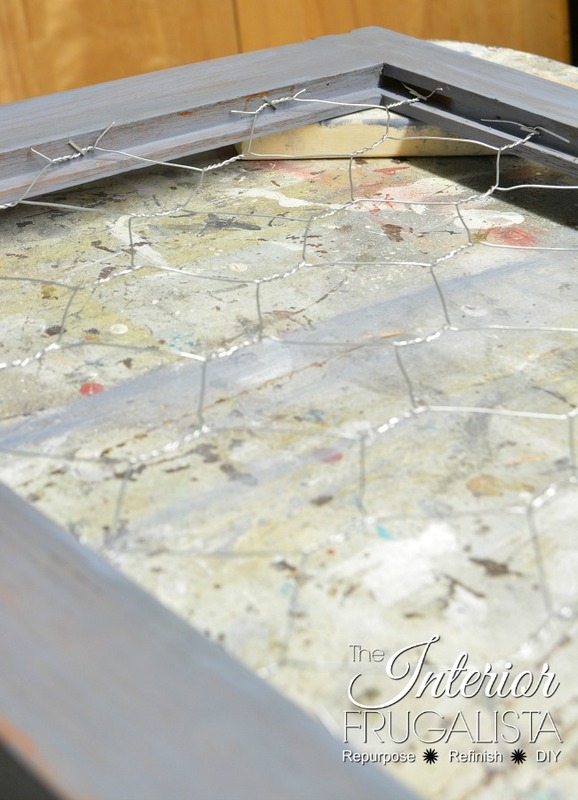 Out with the glass (which I'll reuse someday on a future project) and in with the chicken wire. Two pieces were cut larger than the door opening and lined up for the most optimum placement to attach the staples. Starting at the top the chicken wire was stapled onto the door frame and then pulled tautly and attached at the bottom. Next, each side was stapled and the excess wire cut with wire cutters. I recommend you wear safety gloves during this step. 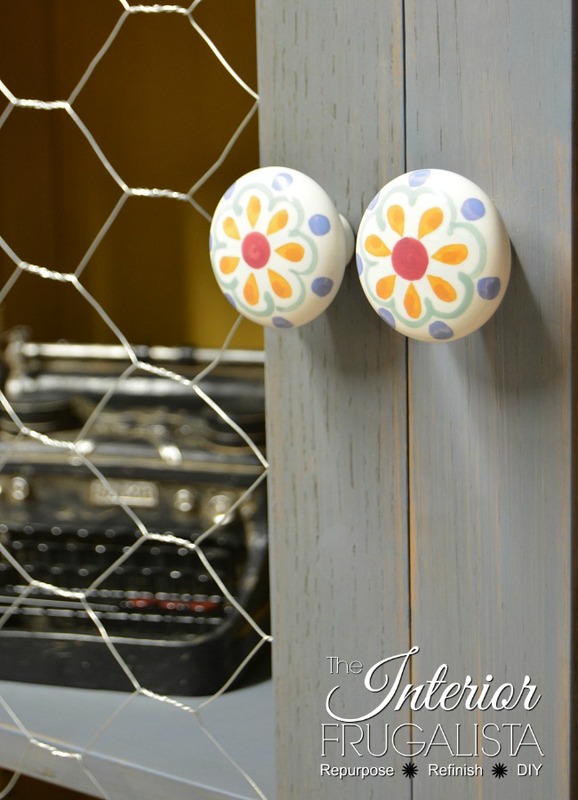 I've had these lovely large hand painted porcelain knobs in my stash for a few years and was so happy to finally put them to good use. 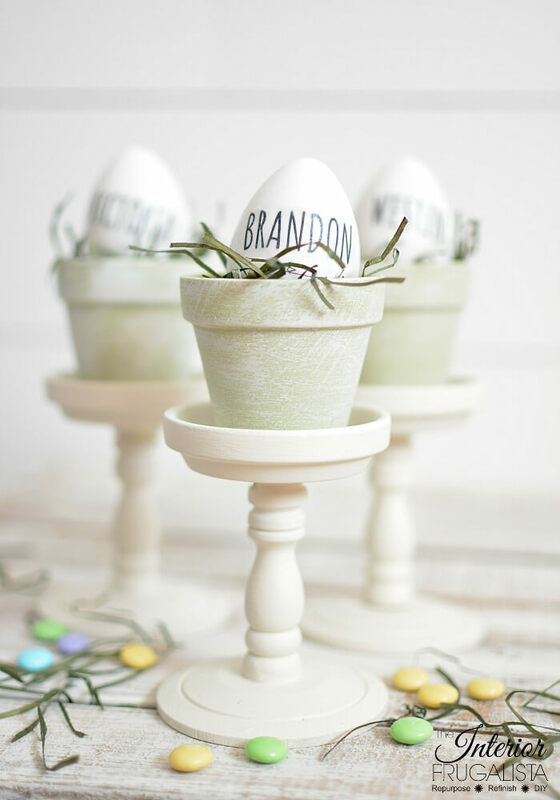 Don't they look perfect not only with the paint colors but with the Farmhouse style transformation? 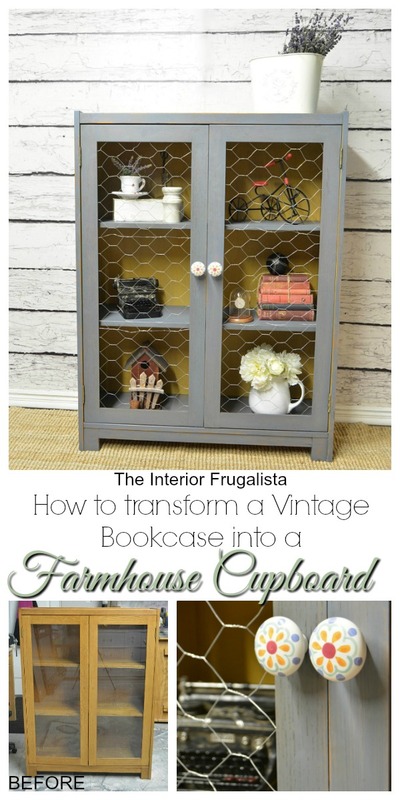 If you like how I transformed this vintage bookcase into a Farmhouse Cupboard, please share it with a friend and/or save it on Pinterest. 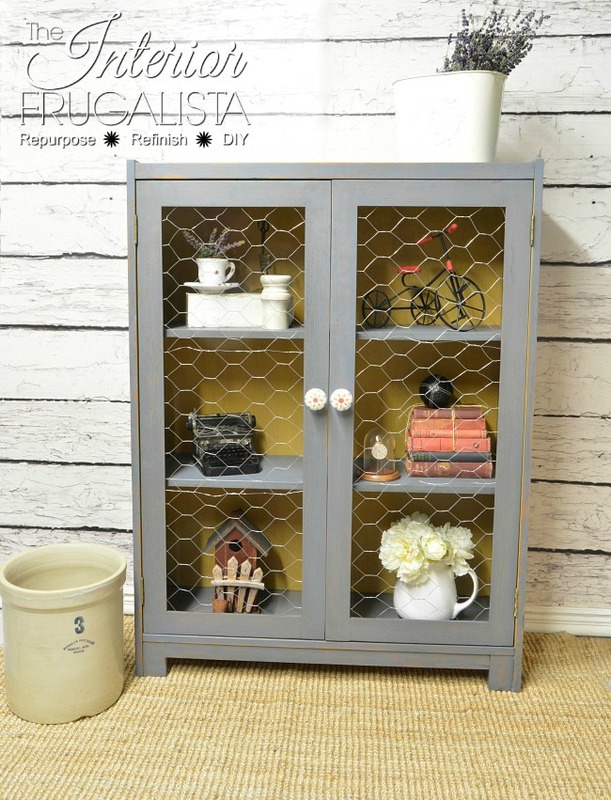 While this vintage painted bookcase cupboard could continue to be used as it's intended purpose, it would also make a great kitchen pantry, bathroom apothecary cabinet for toiletries, bedroom quilt storage, or dining room hutch. I grab every chance I can get to style a piece using bundles of dried lavender from my garden. 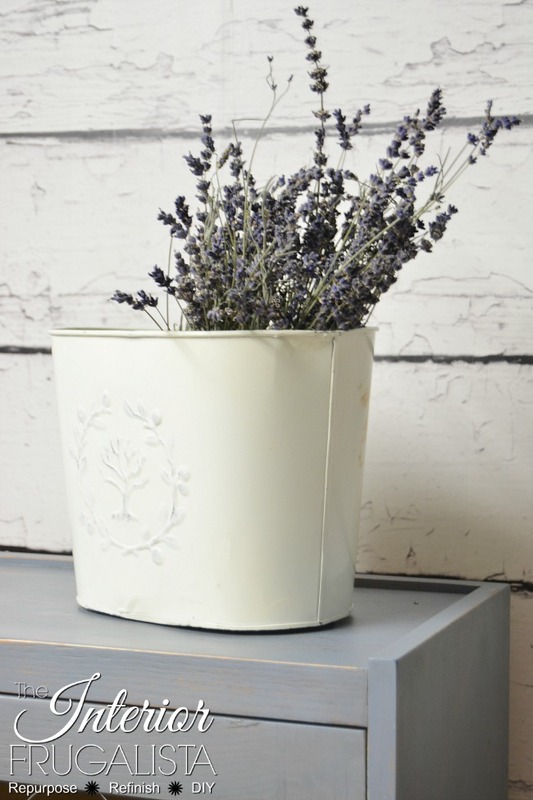 If you grow lavender in your garden you may want to see my post on How To Harvest and Dry Lavender. 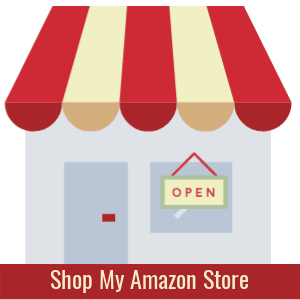 I hope I've inspired you to look at the potential of those double glass door bookcases you often see in thrift stores. 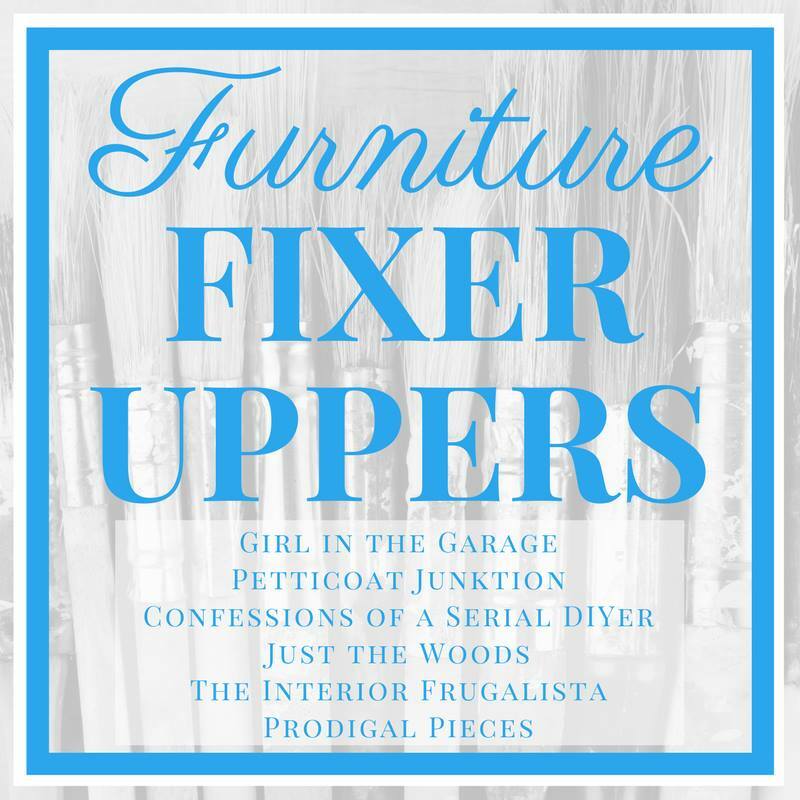 Are you as excited as I am to see how the other Furniture Fixer Upper gals worked their magic to transform these furniture pieces?